Adi Shankar set the Internet on fire last week when he released his “dark and gritty” Power Rangers fan film and is looking to do it again with an animated James Bond bootleg. What I find incredibly interesting about this piece is that it truly does feel like a bootleg copy of a Bond movie due to the changing aspect ratios and the meta-data left in on some of the shots; almost as if Shankar and his team snuck in to a studio and ripped the pre-visualization footage right from a computer. 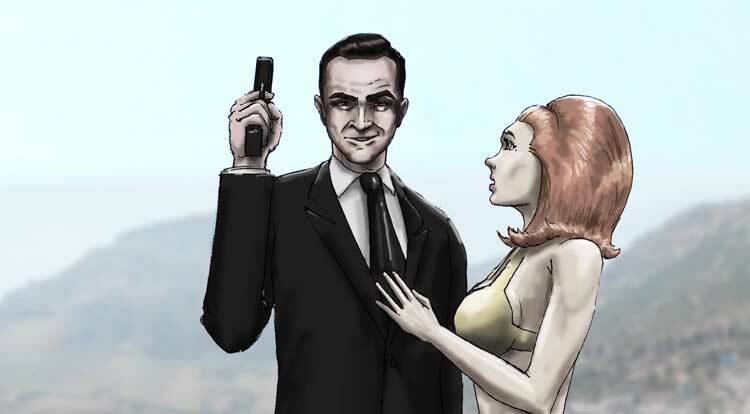 Of course, that is not how the short film was put together though, as the look is most likely an influence from pre-visualization artist Tyler Gibb who is the James Bond: In Service of Nothing‘s director. Shankar ran in to legal trouble last week with Power/Rangers from Saban Entertainment, but the creator says he doesn’t have time to worry about that because younger fans are driving entertainment in a new direction. And how can you argue with him when Power/Rangers accumulated more than 18 million views, even with companies trying to take it off the Internet. There is a changing of the guard, and we need to stop pretending that the people in the digital filmmaking are not credible because the audience is gravitating away from us and to them. You must be fearless, but the vast majority of decisions in this industry are fear-based. The fact is that more people saw Jerry Purpdrank and Britney Furlan on Vine this weekend than saw Will Smith in Focus. It’s not a knock on Will Smith, it’s a commentary on what’s happening in entertainment. This new generation doesn’t hold movies as above or below any other form of content out there. And stuff that is easily accessible online is in a lot of ways closer to what they actually want to watch in terms of the pacing and storytelling. Shankar is certainly in an interesting place creatively as he continues to produce his “Bootleg Universe” short films with views reaching close to 20 million views on YouTube alone and the animated Judge Dredd series (also on YouTube) racking in hundreds of thousands of views while also being an executive producer on large Hollywood action films like Killing Them Softly, Dredd, and A Walk Amongst the Tombstones. Watching Shankar and other creators over the coming years is sure to be interesting as I can only assume more and more will start to place a foot in the traditional method of creating and distributing films while also planting a foot in the wild world of the free digital distribution of work through sites like Vimeo and YouTube. Released at the same time as James Bond: In Service of Nothing, Shankar put out a video explaining why he wanted to do a tale about James Bond. Will Adi Shankar continue his bootleg release streak next week bringing us another take on a well known property? I can only hope so. UPDATE: MGM has decided to pull James Bond: In Service of Nothing from YouTube on copyright grounds.